Bear markets don’t just happen. They hint at their arrival for weeks or months. Alert investors see the bull market dying before their eyes. One of the signs they watch for is a breakdown in market breadth. Those are indicators tracking how many stocks are in uptrends or downtrends. 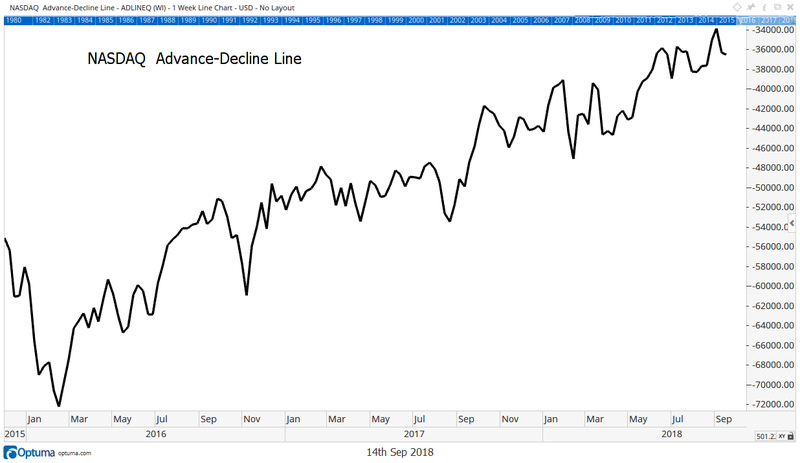 The chart below shows one breadth indicator, the Nasdaq Composite Index advance-decline line (ADL). It’s in an uptrend, showing the bull market is still alive. The Nasdaq ADL shows the number of stocks moving up or down each day. In bull markets, most stocks move up. In bear markets, most stocks move down. To see how powerful this indicator is, let’s look at one more chart. It’s the ADL in 1999. That was the internet bubble. Stock market indexes were rising. But breadth was in a downtrend. Breadth always turns down before a bear market. A military analogy helps explain the concept. In wars, generals lead troops into battle. Both generals and troops contribute to victory. If the general leads and troops aren’t following, the battle is lost. In the stock market, generals are the stocks leading the market. They move major market averages like the S&P 500 Index higher. Right now, the generals are the FAANG stocks (Facebook, Apple, Amazon, Netflix and Alphabet, the parent company of Google). These stocks account for almost 13% of the S&P 500. Troops, in the stock market, are the rest of the stocks. The ADL shows what the troops are doing. Each stock is equally important in the ADL. That’s not true in price indexes. Just five stocks can carry the index higher, even if most stocks are in downtrends. Those five stocks trade on the Nasdaq. 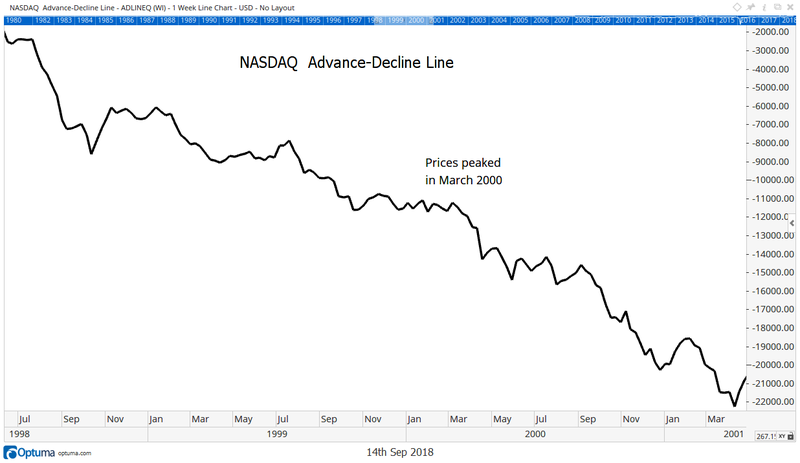 That’s why the Nasdaq ADL is important to watch. Before the bear market starts, the ADL will break down. The downtrend starts with a failure to make a new high. For now, the ADL is in an uptrend. And that means the bull market should continue reaching new highs.